In the quest for healthy hair, many people are prepared to go to great lengths to keep their hair looking healthy, shiny and strong. Using tea tree oil for your hair and scalp is an excellent way to protect your hair from factors that can damage it and keep it looking great. Every day your hair is under enormous stress from the environment, changes in temperatures, humidity and chemicals. Also, your internal health and diet have an impact on your hair’s health and I’ve mentioned it in my article about the best foods and nutrients for healthy, strong and shiny hair. That is why it’s important to strengthen your hair as much as possible so that it always looks healthy. In this article, I will look at just why tea tree oil is great for hair and also look at practical ways to use tea tree oil for hair and scalp. Tea tree oil is extracted from the leaves of the Melaleuca alternifolia plant and is native to Australia. Although it is generally safe for use as a topical application, it should never be ingested because it is toxic. The reason why tea tree oil is so beneficial for hair is because of its antimicrobial, antiseptic, antifungal, and anti-inflammatory properties.1 These properties are important for your hair and scalp health because they destroy toxins, unclog hair follicles and provide deep-down cleansing. Let’s have a look at how you can use tea tree oil for hair. When using tea tree oil, it is important to remember that it should always be diluted with a carrier oil, like castor oil or jojoba oil or other oils for healthy hair. This is because tea tree essential oil is very concentrated and can damage your scalp if it is applied without dilution. There are many ways to use tea tree oil for hair and scalp. You can use it as a deep cleansing and conditioning hair mask or you can add some tea tree essential oil to your shampoo. However you use it, your hair will thank you for adding some tea tree oil to your hair care regime. Tea tree oil is great for your scalp and it can help keep your scalp clean and free from a buildup of oils and toxins. Tea tree oil is also one of the best natural oils for a dry, itchy scalp and it’s also useful for treating ingrown hair on head. There are various factors that can affect the health of your scalp. For example, an overgrowth of fungus can lead to dandruff and an itchy scalp. Psoriasis can cause redness, dryness, and itchiness on your scalp. Some people have very oily skin which is giving their hair a greasy look. And some people have a condition called seborrheic dermatitis, which is an inflammatory condition resulting in yellowish colored dandruff. The antibacterial properties of tea tree oil will help to kill off bacteria-related infections. For example, an article published in the journal Skin Pharmacology and Physiology said that tea tree oil can be used as a way to treat psoriasis of the skin and scalp.2 And indeed tea tree oil is one of the 12 natural ways to relieve psoriasis. These types of bacteria all live on the scalp and a study published in PloS One suggested that dandruff can be a result of an imbalance of the bacteria that is on your scalp.5 And indeed tea tree oil is one of the best essential oils for dandruff. So, massaging tea tree oil into your scalp together with a carrier oil, your shampoo or hair mask can help stimulate blood flow to your scalp and help maintain a healthy scalp. In order to use tea tree oil for hair and to get all its amazing benefits, you can use some tea tree oil in your shampoo, or even create your own shampoo. When you massage the tea tree shampoo into your scalp, you are helping to provide deep-down cleansing for your hair follicles, and at the same time protecting your hair. To make the tea tree oil shampoo, you should mix about 8-10 drops of tea tree oil for every 1 oz. (30 ml) of your shampoo. Alternatively, you can add 4-5 drops of tea tree oil and 4-5 drops of lavender oil. Massage the shampoo into your scalp and leave for around 5 minutes (make sure it doesn’t get into your eyes). Rinse with water. If you prefer to make your own shampoo without chemicals, you can try my recipe for a homemade Castile soap shampoo. One of the best ways to use tea tree for your hair is as a conditioner. You can either make a hair mask before you wash your hair, or you can use it as an after-wash conditioner by adding it to your regular conditioner. If you want an even better deep-down conditioning, you can put your hair in a steam cap and leave it overnight before washing it as usual in the morning. Wrap your hair in a warm towel and leave for 2 to 8 hours. If you want to stimulate hair growth you can also add rosemary essential oil or peppermint essential oil to encourage hair growth. Tea tree oil is also an effective treatment for hair lice. The British Medical Journal reported on a case where tea tree oil was used to treat head lice in a small rural school.7 The schoolchildren had to wash their hair twice a week, and every day their hair was sprayed with a tea tree oil solution. It concluded that the level of infestation fell after the application of tea tree oil products. The following morning, comb out your hair thoroughly using fine tooth comb. Wipe the comb frequently with a clean paper towel to remove nits and lice. Then, shampoo and rinse with water to which you’ve added a few drops of tea tree essential oils to maintain the lice repellent properties of the treatment. Use conditioner if you wish. Tea tree oil is also a very effective treatment for dandruff. There can be various reasons why a person suffers from dandruff, and one of them can be caused by a yeast infection or fungi (Pityrosporum ovale) on the scalp. The good news is that tea tree oil can be used to treat dandruff and scalp infections. Further reading: You can also try other methods to treat dandruff. Please read my article about the most effective ways to treat dandruff naturally. There have been many claims made about tea tree oil and hair growth. Although there haven’t been any studies which conclusively prove that tea tree oil can help hair regrow, there is enough evidence from research to show that it promotes the growth of healthy hair. For example, some hair loss can be the result of hair follicles becoming clogged or inflamed or because of harsh ingredients used on the hair which can dry out the scalp. There was an interesting study into tea tree oil and hair loss which showed that it can help traditional hair re-growth remedies work more effectively.11 In the study, tea tree oil was mixed with minoxidil, which is a drug used to promote hair regrowth, and an anti-inflammatory drug called diclofenac. It was found that the combination of tea tree oil, an anti-inflammatory drug, and minoxidil was far more effective than just minoxidil alone. To help promote healthy hair growth, you can use some of the recipes mentioned in this article. 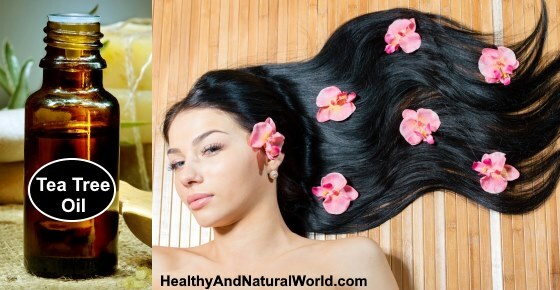 There are also other ways to encourage hair growth which you can read in my article on How To Make Your Hair Grow Faster: The Best Natural Ways. As with all essential oils, tea tree oil shouldn’t be applied directly to the skin, especially over large areas like the scalp. It is generally safe to use when applied topically along with a carrier oil. But it’s always a good idea to do a skin patch test first to make sure you don’t develop any skin irritations. You should never ingest tea tree oil because it is toxic. You can find more useful information about essential oils in my e-book Magical Aromatherapy. This e-book will help you to discover the power of essential oils and the most effective ways to use them. 1. Tea tree oil: Antimicrobial and other medicinal properties. 2. Tea tree oil as an antipsoriasis weapon. 3. Antibacterial activity of tea tree oil. 4. Antimicrobial effects of tea tree oil. 5. Dandruff is associated with disequilibrium of bacterial and fungal populations. 6. Antibacterial effects of coconut oil. 7. Treatment for head lice. 8. Activity of tea tree oil against head lice. 9. Treatment of dandruff with 5% tea tree oil shampoo. 10. Antifungal activity of tea tree oil. 11. Evaluation of minoxidil microemulsion.